Sahara Nights in the Roundhouse Studio Theatre in Camden brought together musicians, film-makers and spoken word artists to highlight the plight of the Sahrawi refugees, but also to celebrate their culture. On a stage surrounded by colourful tent fabric created by women in the Sahrawi refugee camps, musicians from around the world entertained a full house. Underlying the enjoyment, however, was a serious message. As people entered the venue, they were greeted by the sound of kora and song from Mosi Conde, a griot from Guinea-Conakry, with exclusive images from the Sahrawi refugee camps by photographer Ed Harriman on a screen behind him, before MC Dan Tsu took to the stage. The event was the public launch of a project called Studio-Live, which aims to empower those in the refugee camp to produce their own music, through providing recording equipment and training refugees as engineers. The project is led by UK-based charity Sandblast, together with Fairtunes, SOAS Radio, The Moringa Tree and the Saharawi Ministry of Culture in the refugee camps. 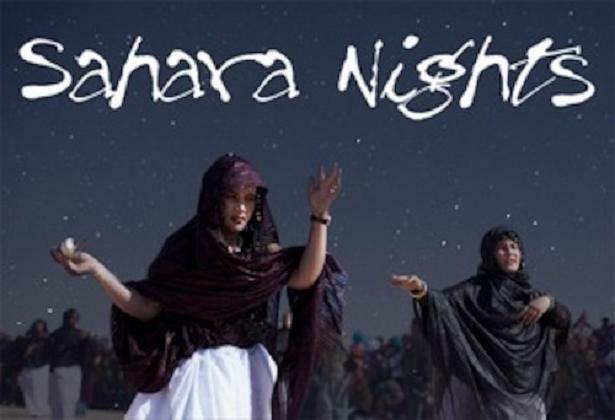 Sahara Nights showcased Sahrawi music, with performances by half Spanish, half Sahrawi singer Suilma Aali and Aziza Brahim, who was born in the refugee camps. Both mix elements of Sahrawi traditions with other aspects of African and contemporary music. Aziza’s grandmother, Lkhadra Mabruk, is a renowned poet who documented the 16 years of war in the region through her poetry. Lkhadra is herself the subject of a documentary for Al Jazeera and filmmaker Noé Mendelle presented a short extract of the film at Sahara Nights. Another filmmaker, Saeed Taji Farouky, presented a rough cut of part of his film, The Runner, about the champion long-distance runner Salah Ameidan, who has become a symbol of Western Saharan independence. The audience was also treated to English translations of the short stories of Sahrawi writer Mustapha Abdel Dayem, who served a three-year prison sentence for “offending the Moroccan flag”. Poet and playwright Inua Ellams read five stories that told of the experiences of ordinary Sahrawis living through war and occupation. Other acts performing at Sahara Nights were Venezuelan singer Luzmira Zerpa who was joined onstage by two Ghanaian percussionists and Ruby and the Vines, fronted by English/Congolese singer and bassist Binisa Bonner. The night finished up with a lively jam session featuring most of the musicians from the previous acts. “I really hope that this Studio Live launch tonight is going to raise the profile of the Sahrawi situation through music and really get people talking about why a people have been occupied illegally for 36 years. They’ve been living in refugee camps for so long with so little international support to resolve the situation. Sandblast are keen for more people to get involved in the Studio-Live project, whether by providing technical support or helping promote the artists and the music. They can be contacted via their website: http://www.sandblast-arts.org/ or on Twitter @sandblastarts . Well done! We recommend also the Human Rights Symposium at dOCUMENTA (13) July 8-15, 2012, presented by Bettina Semmer at the Art of Saharawi Cooking by Robin Kahn and the cooperativa Unidad Nacional de Mujeres Saharauis, a full week a experts analysis and information, to be viewed on http://www.sahara-libre.com. Go and visit dOCUMENTA, the world’s most prestigious art show, this year, and see the amazing Khaima (Sahrawi tent), project #90, Karlsaue, in Kassel, Germany, and support the just cause of Sahrawi people to Human Rights and Independance.